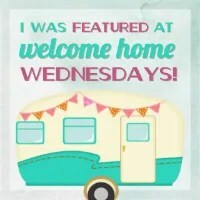 Welcome to Welcome Home Wednesdays #63!!! HAPPY WEDNESDAY! It’s been a busy week here so far. So many little things to get to. I meet a new local bloggy friend for coffee tomorrow, so that will be fun! Need to find some time to get to blogging, though! I have a ton of Holiday ideas that just need to be executed! Hope your 4 quarter plans are coming together! 5 Gals, 5 Blogs & 1 Great Party! Link up once to appear on 5 Amazing Blogs! Like any good hosts we’re sitting right by the present table waiting until our guests leave so we can go through the loot… the loot being your Welcome Home Wednesdays #63 links! We can’t wait to check out what you’ve left for us. Trust me there will be a lot of pinning, tweeting and facebook sharing going on in the near future… we can’t wait to show off what you’ve left! Erin, thank you for hosting this fun party each week!!! Thanks for coming by Katrin! I hope you’re having a good week! See you next time. Erin, thank you for the party. I have so many ideas to execute that I hope there are enough hours in the day! LOL! Thank you for hosting again this week. Your party always has so many wonderful links! Have a good week. I know Marilyn! So many good links and inspiring projects! I hope your week is a good one and your weekend is even better.